Britain has a fine tradition of making films in which the working class are very much front and centre of proceedings and Pride is the latest such offering. The backdrop for this story is the 1984 miner’s strike, a 12-month battle between mine workers and the Thatcher government over the decision to close several mines and the subsequent loss of 20 000 jobs. This based-on-real events story centres on a group of gay and lesbian activists determined to raise money to support striking miners in their battle with authorities, even if their efforts aren’t appreciated by all of those they are trying to help. There is a lot to like about Pride, a movie that addresses some very serious issues (worker’s rights, homophobia, the onset of AIDS) and is a lot of fun without ever trivialising the plight of anybody involved or the circumstances in which they find themselves. This high quality historical comedy-drama kicks off with 20-year-old Joe taking his first tentative steps into the world of gay activism, hesitantly joining the throng in the 1984 London Gay Pride march. The wide-eyed Joe (George MacKay) becomes enamoured with the confidence of those he meets and soon finds himself part of a group calling itself LGSM (Lesbians & Gays Support the Miners), led by the bombastic and somewhat idealistic Mark (Ben Schnetzer). Although some within the gay community believe that Mark and his group should be more concerned with the growing AIDS crisis, Mark is adamant that it is important to show their solidarity with another group being oppressed by the Government. However, their efforts are stymied initially when they can’t find any mining organisation willing to accept donations from ‘poofters’. Eventually, the group find themselves in the small, conservative Welsh town of Onllwyn at the invitation of union representative Dai Donovan (Paddy Considine). As expected, the clash of cultures produces plenty of laughs and whilst it can be argued that there are stereotypes at play in the attitude and behaviours from both the townspeople and the members of LGSM – such as Dominic West’s cynical yet flamboyant Jonathon – the film never shies away from the seriousness of the situation. Everything about this film evokes the time and place in which the events take place. From the fabulous soundtrack that features some of the most iconic tunes of the period – Frankie Goes to Hollywood to Billy Bragg to Pete Shelley and many more besides – to perhaps the greatest mullet ever to grace the big screen. This majestical mane is donned by Jessica Gunning as Sian James, a housewife who arises from the malaise of urban domesticity to emerge as a voice of reason within her community. Despite some initial reservations, the town council embrace LGSM and their fundraising efforts, although there are some homophobic holdouts to remind us that not everybody is as enlightened as we might like. Cultural collisions abound and friendships are made amidst an environment of uncertainty and distress for the mining families. Throughout it all, Joe grapples with his own identity, remaining very much in the closet to his family, concocting elaborate stories to explain his absences from home. It is so strange to see Considine as a dignified middle-aged man, but he is terrific as Donovan, a man whose willingness to embrace the support offered by LGSM proves the catalyst for a collaboration that ultimately results in significant changes in attitudes within the union movement more broadly. Bill Nighy takes a step back from his more typical on-screen personas as the understated Cliff, a quietly-spoken community stalwart whose own history is less of a secret than he knew, while Imelda Staunton is hilarious as Hefina. 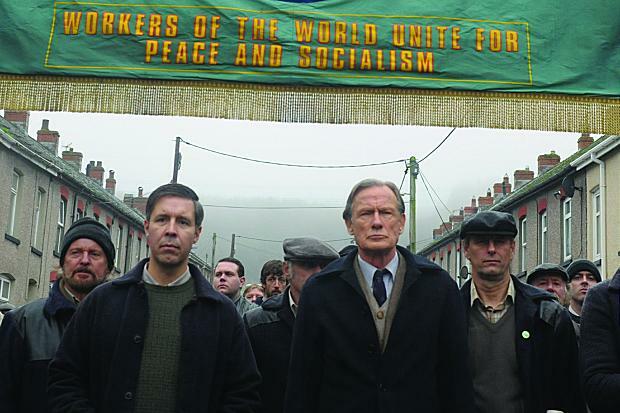 There is plenty of Full Monty-like humour throughout, with many of the best lines coming via the working class women whose spirit and determination goes beyond that of the men folk who have the most to lose as a result of the mine closures and subsequently the most to gain from the support being proffered by LGSM. 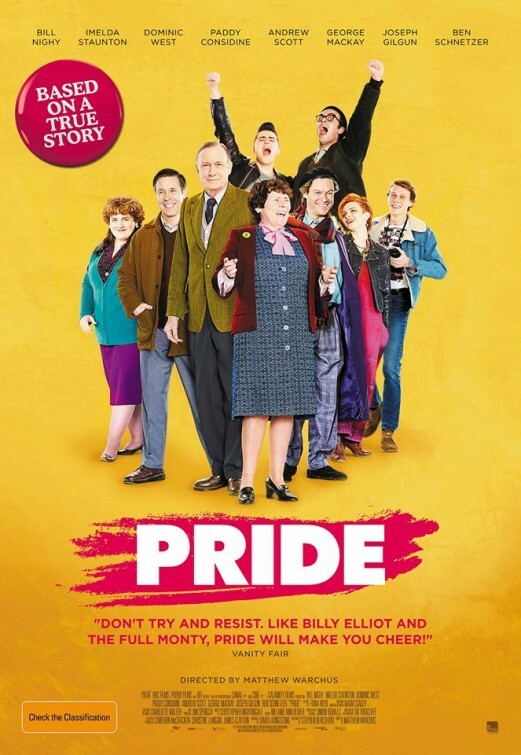 With despair, tragedy and heartbreak in the mix and a collection of characters who, despite their flaws, are utterly likeable, Pride takes a light-hearted but never trite examination of characters willing to take a stand in the face of adversity and injustice. With his first feature film in 15 years, director Matthew Warchus has constructed a film that tracks a particularly nasty period in British social and political history in a way that is enjoyable without ever disrespecting the sacrifices of those at the forefront of the fight/s.